Our Youth Ministry includes Middle School (Grades 6-8) and High School (Grades 9-12). 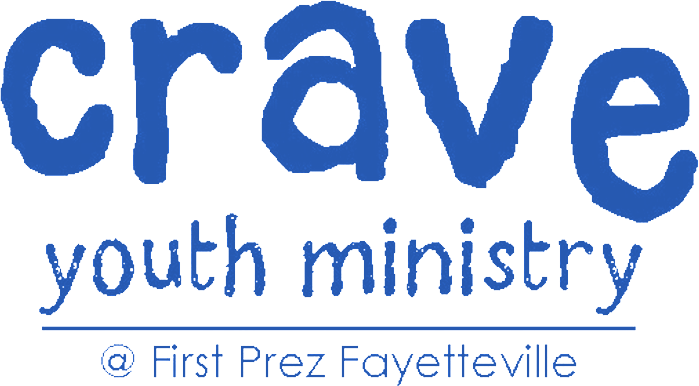 The church youth activities are open to any Christian or seeking preteen or teenager in the Fayetteville area. Serve others through mission work/opportunities. Learn and discuss relevant topics of the Christian faith. Develop friendships through times of fellowship and fun. 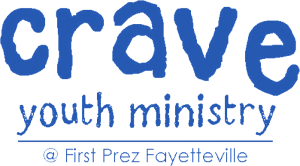 CRAVE Youth Ministry exists to…Challenge students to experience Jesus, so they can…Reach their community for Christ; to…Acquire accountable Christian friendships, and help them…Visualize their God-given talents, so they can…Exalt God with their lives. Wednesday Together: Youth meet for studies into relationships Discussions will include relationships with teachers, peers, friends, foes, siblings, parents, and others. Sunday School: On Sundays from 9:45-10:45 am our youth gather to study the Bible, topics relevant to youth, and current events. Middle School and High School youth meet in Room 228. CRAVE Youth Group: What do you CRAVE? The youth group on Sunday evenings is a time of fun and fellowship. We eat, play, worship, and pray together. Mission: We love to share our love of Christ with others. We strive to focus on at least one mission project a month, particularly in and around our community. We are always looking for ways to love, help, and empower the people around us. Click here for the spring youth schedule. You’re running out of time to sign on to the annual ski trip to Sugar Mountain from January 19-21, 2019. It’s $300 to ski and $325 to snowboard. Scholarships are available. Click here to sign up. The youth are selling hot chocolate mix as part of the fundraising for their January 2019 ski trip. Jars are $10. Pick up a jar today in Eller Hall or order here. The youth are collecting plastic grocery bags in a mission project that will create pillows and pallets for the homeless. Bring bags to bin in Eller Hall. The youth will be going to Louisville, Kentucky from June 8-15. The mission trip is open to both middle and high school students and will cost $300 per person, but there will be scholarships and fundraising opportunities available. Applications are available for download here and the deadline will be March 1. Adults are needed to help with CRAVE on Sunday nights from 5-7 p.m. They would not have to commit to being there every week. If interested, email Jonathan West at jonathan@firstprez.com.